Ruth Galloway is a forensic archaeologist. 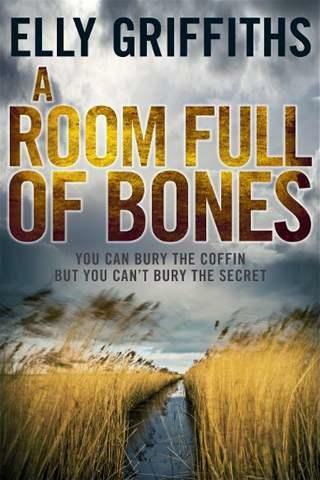 She’s called in to examine the bones of a medieval bishop whose coffin has been discovered during a dig. Bishop Augustine is the ancestor of Lord Danforth Smith, horse trainer & owner of the Smith Museum. When Ruth arrives at the museum for the opening of the coffin, she discovers the museum’s curator, Neil Topham, lying dead on the floor near the coffin. DCI Harry Nelson is called in to investigate Neil’s death. There are no obvious signs of injury but the window was open & a book with an underlined warning is discovered. Nelson also discovers threatening letters addressed to Neil & Danforth Smith from a group called the Elginists, demanding the return of the bones of Aboriginal ancestors. Lord Smith’s grandfather had been a 19th century adventurer who has brought the remains back from his travels in Australia. The remains, including several skulls, are not on display but kept in a back room. Lord Smith, however, refuses to return them. Have the Elginists stepped up their campaign of repatriation to include murder? Nelson is also coping with a big drugs investigation. Drugs are being imported from overseas somewhere along the Norfolk coast. His team are running surveillance at night as well as now investigating the possible murder at the museum. Nelson is also dealing with his wife, Michelle’s, discovery that he’s the father of Ruth’s daughter, Kate. Michelle has forbidden him to see either Ruth or Kate. Their few work-related encounters are awkward & Ruth tries to forget Nelson by pursuing a new relationship with Max, a man with no baggage except a boisterous dog called Claudia. Ruth also has a new neighbour in her remote Saltmarsh neighbourhood. Bob Woonunga is an Aboriginal writer & poet. He’s taking up a teaching post at Ruth’s University & her Druid friend, Cathbad, recommended that he rent the house next door to Ruth. Bob is also pursuing the repatriation of the remains at the Smith Museum. Ruth is unsure about Bob. Kate & Flint, her cat, love him but she’s unsure how far to trust him. When Danforth Smith dies suddenly & then Nelson becomes seriously ill, Ruth is forced to consider Cathbad’s belief that they’ve been cursed by the spirits of the ancestors. I really enjoy this series & this is an excellent addition to it. Ruth & Nelson are very sympathetic characters & their evolving relationship is always interesting. I also love Ruth’s relationship with Kate, her uncertainties as a mother & her continual juggling of work & motherhood. The writing is in present tense, which I usually dislike, but I get so caught up in the story that it only trips me up now & then. My main niggle with the previous books in the series was that Ruth always ended up in peril of her life & it just struck me as ridiculous that she could get into these situations every time. Thankfully, this doesn’t happen to Ruth in this book although another character, who should know better, does get herself into a sticky situation by ignoring basic common sense. If she had only remembered what Harriet Vane did in a similar situation in Gaudy Night, she would never have ended up in peril of her life. Still, it does result in the solution to one of the mysteries of the plot & the eventual opening of the bishop’s coffin, which contains a surprise or two of its own, provides the rest. The historical & archaeological themes of the books interest me too & Cathbad’s mystical new ageness gives another slant to Ruth’s devotion to scientific standards of truth. How funny…I just finished this today too! I like Ruth and Harry, though I agree with you that Ruth was at death's door a little ridiculously often in the first books. Looking forward to the next one… and I'm going to look for the Julia Probyn books you've been writing about. I hope the library has them! This is one I'd like. I've recently discovered Elly Griffiths and whipped through all four of them in record time. I have a few quibbles but they do keep me happily reading — and I so agree about Nelson and Ruth, and Ruth and Kate. I'm very curious to know what will happen with Cathbad's love affair — and so hope there's a new novel on the way, though I haven't seen it announced yet. Great minds read alike, Audrey! I do like this series & I'm willing to adapt to the present tense & the occasional annoyance (like Ruth always in peril) because I love the characters & the archeological slant of the plots. The Julia Probyns have been reprinted as POD & e-books by Bloomsbury but you might find older copies at the library if you're lucky. I'm halfway through the last one now & I'll be sorry when I finish. I hope you can get hold of a copy Mystica. Cathbad's love affair seemed doomed at the end of this book but I wonder who the father of the baby really is?? The next EG novel is A Dying Fall to be published in March so not too long to wait. I'm sure we both have a few books to go on with in the meantime! Aren't her characters great? I love that Ruth is not your typical heroine, and I'm eager to see how her relationship with Nelson progresses. (Minor quibble in her latest book: no one lives 'in' Cape Cod, they live 'on' Cape Cod.) I'm in the same situation several of us seem to be: waiting impatiently for her next book! Yes, I think Ruth & Nelson are terrific & their relationship is keeping me on tenterhooks. I didn't pick up the Cape Cod reference but I thought her Aboriginal character, Bob Woonunga, was well-done (not that I'm an expert).